Saturday was change over day and it marked the start of a busy week with lots of great new faces. We will miss the children who have left us but we are very excited about working with the new children who have just arrived. On Sunday we went to Eastbourne where the children enjoyed the beach for a few hours before heading off into the town shopping. When we got back we were all very tired so were happy to settle down in front of a film. 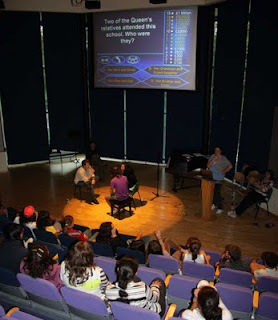 On Monday, the children were put into house groups and were involved in the first of the contests - Who Wants To Be A Millionaire? Each house was represented by a boy and a girl and congratulations must go to Pamina and Evgeny from Jelly and Ice Cream house who, with £64,000 were our champions! Yesterday we had better weather so the children played team games including Oh Mummy, Neck the Orange and Last Man Standing. Last Man Standing involved children standing on a pillar with a straight face and not smiling or laughing whilst another team tried to distract them. We were very impressed with Olivia from Bangers and Mash who managed to last the whole game!